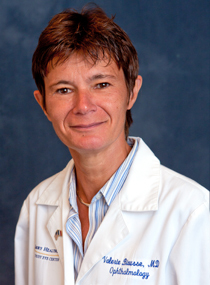 Valérie Biousse, MD, is a professor in the section of neuro-ophthalmology at Emory Eye Center and in the department of neurology, Emory School of Medicine. Dr. Biousse is a fellow of the North American Neuro-Ophthalmology Society and of the French Society of Neurology and a member of the American Neurological Association, and multiple other national and international societies, including the American Academies of Ophthalmology and Neurology. She serves on the editorial board of the Journal of Neuro-Ophthalmology. She currently also serves on the board of directors as Vice President of the North American Neuro-Ophthalmology Society. She has more than 300 publications, including scientific articles, book chapters and books, including the primary textbook Neuro-Ophthalmology and Walsh & Hoyt’s Clinical Neuro-Ophthalmology, 6th Edition, 2005, and the practical textbook Neuro-Ophthalmology Illustrated (Thieme, 2009 and 2016), a valuable resource for practitioners who have patients with disorders of vision and the brain. Neuro-Ophthalmology Illustrated received the British Medical Association best book of the year award in 2016 (category Neurology) and the “PROSE award” from the American Association of Publishers in 2017. Dr. Biousse regularly lectures throughout the world. Her current research focuses on four primary areas: (1) idiopathic intracranial hypertension, (2) the use of non-mydriatic fundus photography for the diagnosis of neuro-ophthalmic disease in various clinical settings, (3) diagnostic errors and referral patterns in neuro-ophthalmology, and (4) ocular manifestations of cerebrovascular diseases.